The symbol “Yubatake” (hot water field) of “Kusatsu Onsen Hot Springs” in Gunma Prefecture, famous for rich and good quality hot springs. “Yubatake” is a facility that collects hot spring constituents Yunohana (hot-spring incrustations) and adjusts the temperature of hot water. The scene which pours hot water with wooden gutterings is picturesque. 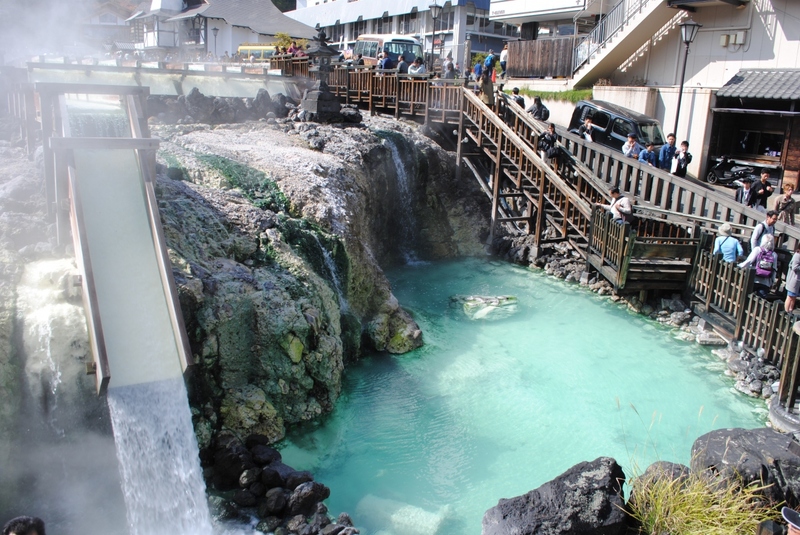 The Kusatsu hot spring, which 4000 liters of hot water gushes out every minute, is proud of the best natural discharge in Japan. So, the “Yubatake” is also huge and spectacular. The illumination is lit from the time the sun sets, the neighborhood becomes a fantastic atmosphere. 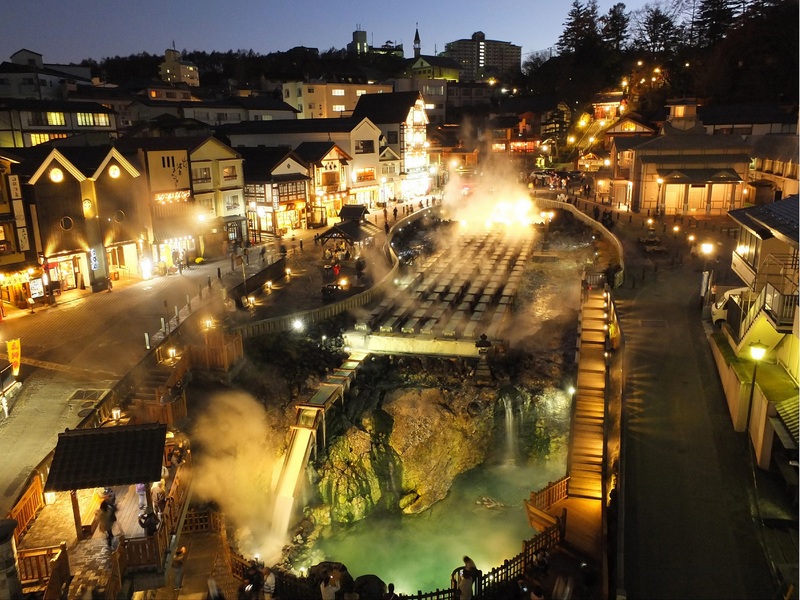 The hot spring resort and the appearance of the tourist who wears a yukata is wrapped in clouds of steam. Why don’t you become a piece of emotional landscape? It is lit up until about 23 o’clock, so not only walking after dinner, you can see it slowly after the party or after enjoying the hot spring. Many tasteful buildings which stand in a row in the Kusatsu Hot Spring town are also lit up beautifully. The rows of houses projected on the water surface are also beautiful. Since there is also an alley illuminated by the light of the lantern, please walk also paying attention to the places other than the “Yubatake”. In vast “Yubatake”, hot-spring incrustations and the original color of hot water can be seen. Especially the “hot shower-bath” where hot spring runs down has a beautiful color of emerald green. 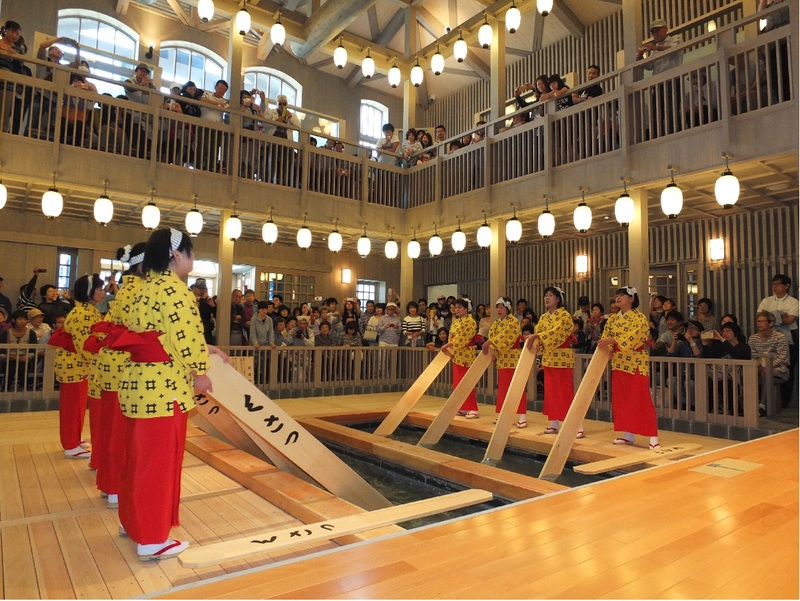 “Yumomi Show” will be held at “Netsunoyu Onsen Hot Spring”. 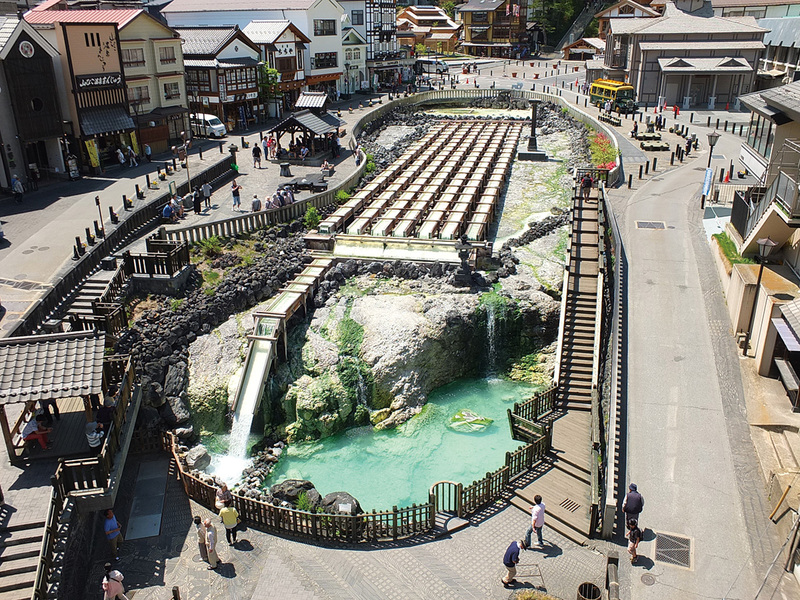 The source of Kusatsu Onsen Hot Springs is hot, most of which is close to 50 degrees Celsius, so you can not take a bath as it is. However, if water is put in in order to lower the temperature, the efficacy of the hot spring will be diminished. So put “Rokushaku Ban” (board of 1.8 meters in hight) in a hot source, stir the hot water, “Yumomi” for lowering to temperature until it can take a bath was invented. “Yukemuri-tei” is free Hot-Spring Footbaths next to “Yubatake”. It is Azumaya (a cottage) of all-cypress, and the building has reproduced the public bathhouse “Matsunoyu Hot Spring” that was located in this place in the Edo period. 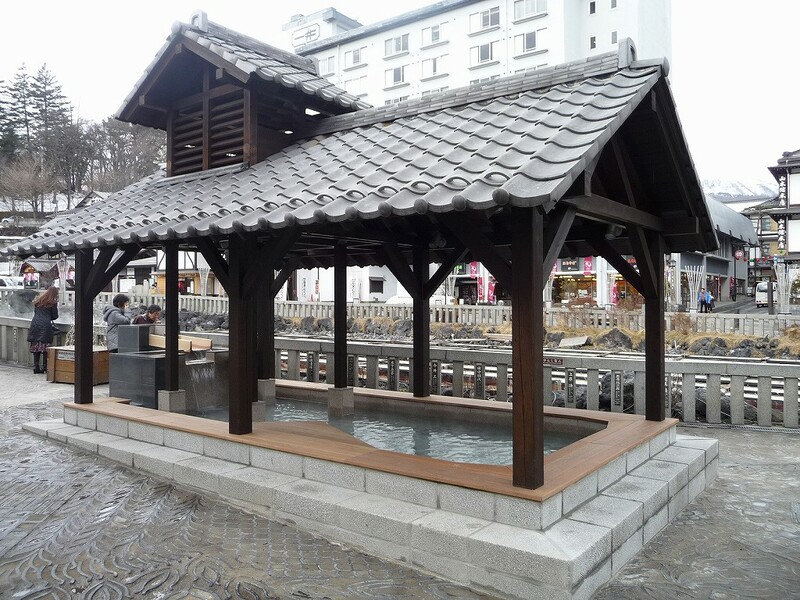 Because Kusatsu hot water is strongly acidic at high temperature, it seems that it is effective of bathing even by immersing your hands and feet for a few minutes. It is available 24 hours. Price: Please refer the official web page.